Moving to Australia where the Rainbow Lorikeet has topped a national poll for the third successive year. Moving to Australia you’ll find colourful and noisy Miner Birds came second as the country’s most-recognised bird. Black and white Magpies are the third most frequently-noticed species of garden bird. 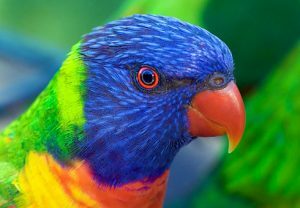 The Rainbow Lorikeet has spectacular colourful plumage – likened to a Hawaiian shirt. Almost 1.4 million birds were counted in this year’s census, according to BirdLife Australia, a 40 per cent increase compared to the previous year. The BirdLife Australia count was held as part of National Bird Week during October and involved residents taking note of how many birds they spotted in their community over a 20-minute period. This year’s national birdwatching survey recorded over 583 bird species. BirdLife Australia’s Sean Dooley said the results of this year’s count would give the organisation a much stronger sense of what was occurring to Australian birds across the country. Next year’s Aussie Backyard Bird Count will start on October 23 2017.